Thought for the Week: What if there was no time? Thank you to Mr McCormack and Year 5 who were very concerned when Year 6 borrowed their clocks last week! Mr McCormack suggested this as our thought for the week. if there was no time we didn’t know what was the time or we won’t know about the olden days of how it was. I disagree with you,because in the olden days they didn’t have time. Sy’rai – how do you know that they didn’t have time in the olden days? Do you mean they didn’t have clocks to measure time? 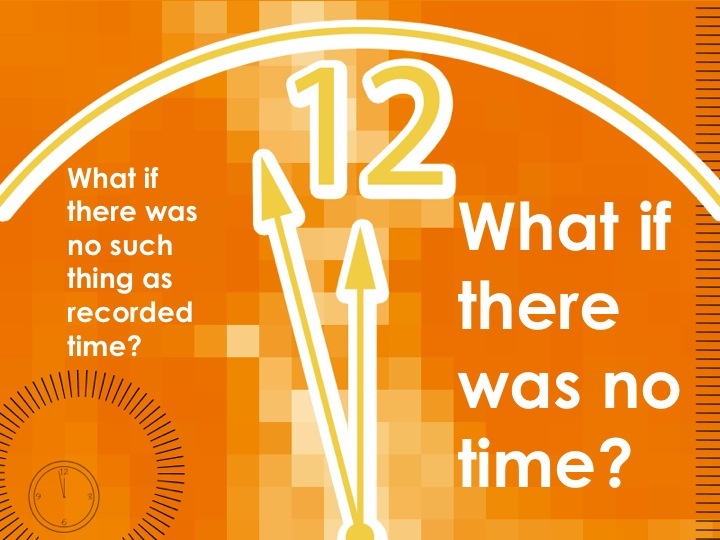 How do you think people measured time in the past? or when home time is or we will be living in the school ! To me time is a distance to another distance. I meant they did not have clocks but had time. They could measure time by the seasons for example sun set,sun rise to know when its day and when its night,Sunny times ,rainy times,snowy times,harvest times,leaves falling of the tree times and growing back times. I agree with Thaniya because looking up in the sky don’t give you the exact time. You would just know what time period it is like : Dusk , dawn , morning ,afternoon , evening and night . If there was no such thing as time we might be late for something like an important appointment. Then no one could go to parties and know what time it is. No one could go to meetings on time. No one could be on time any where. If there was no such thing as time then you could not say “I’ll meet you at 7:00″because you don’t know what time it is but, if you look up at the sky and its light then you know that it’s midday or morning. I think if there is no time people would have no punctuality. If we don’t know what time it is we don’t know when to sleep and wake up. It would be great because we would not have to be at school for 8.45!!! If we don’t have time you would be late for work,school or a meeting. No one knows what time their party,meeting,or what time school would be open so they would be late everytime. It would be difficult to meet people, we would have to use the sun to judge when to meet them (Seven). Things like TV schedules would be mixed up and people wouldn’t know what time things were. (Taylor). It won’t matter if there’s no phones because we have mobile phones, you can just call or text people to arrange when to meet them. However, it would be hard because your bed times would be all mixed up.(Tia). You wouldn’t know when your birthday was or how old you are if there was no time or months. (Camron W). You wouldn’t have hours so we wouldn’t have days. (Jayda). If there was no time days you wouldn’t really know if days had passed. I wouldn’t know when my bedtime is. (David). It could cause problems if you’re cooking because we wouldn’t know how long to cook things for. (Nyah). What if you wake up early when it’s dark, or you stay up when it’s light because you don’t know what time it is you’d be confused and very tired. (Samuel). IF there’s no time you’d be able to do anything you wanted, like going to bed when you want. (Uzama). IF there’s no time you’d invent a new way of counting things. (Remus). If there was no time, does that mean there would be no numbers? (Shaddai). How would you know when to work or if it was the weekend? (Cam’ron F). Thank you Ruby Class, it is nice to hear all of your thoughts. If there were no clocks and watches keeping us in check, we might end up having more time to spend with people. Also it means not even phones would tell us time.